This game was introduced from Shimoda, via the first foreigners there, and soon spread all over Japan. For example three sit around the table. The husband asks if his wife has cheated on him. The husband, wife and one friend sit in silence, then the table moves toward the wife ... the result, they get a divorce . . . Such are the real-life stories around the Kokkuri game. 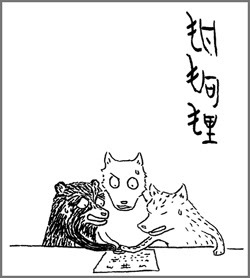 (ko 狐, foxes; gu 狗, tengu; ri 狸, tanuki). The word kokkuri refers to the game, the actual physical apparatus, and the spirit(s) believed to possess the apparatus in order to communicate with humans. 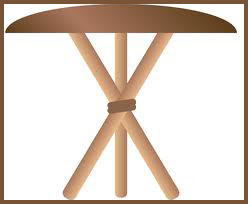 The physical mechanism is composed of three bamboo rods arranged to make a tripod, upon which is placed a small pot, which is covered by a cloth. Three or more people will place their hands upon the kokkuri and ask the spirits a question, which that spirit will in theory answer by moving the pot or remaining still. 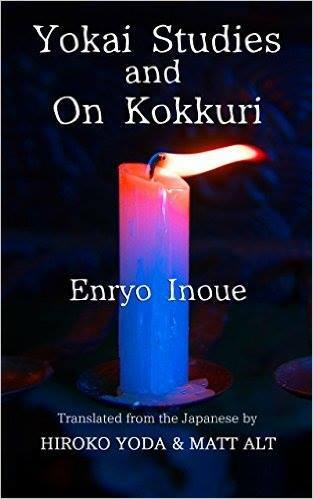 Japanese folklorist Inoue Enryoo wrote about the kokkuri phenomenon, denouncing it as mere superstition, yet his efforts did not succeed in depopularizing the game. Some scientific figures of the age attempted to explain the phenomena with the more scientific sounding yet ultimately equally mysterious trope "human electricity". He is the founder what later became Toyo University 東洋大學. There he established a new discipline for the study of the mysterious he called yokaigaku 妖怪學. A prolific author, Inoue published numerous works on Buddhism, philosophy, education, religion, and monsters. He is most famous for Bukkyō Katsuron, 佛教活論 and his popular lectures on the mysterious. He contributed to attempts to 'modernize' Buddhism by arguing for its compatibility with Western philosophy and science. Inoue spent the later part of his life traveling the country giving lectures discouraging belief in monsters. He died 6th of June 1919 while giving a lecture in Dalian, China. "Many people believe that there are certain things that transcend reason - things that exist beyond human knowledge and cannot be understood using it. In other words, they are extra-logical. However, extra-logical does not necessarily mean unknowable." Clairvoyance. Possessions. Mind-reading. Dream projection. Encounters with demons and divinities. This ebook contains translations of two key essays by the Japanese scholar, philosopher, and "ghostbuster" Enryo Inoue (1858 - 1919). The first is the 1891 "Introduction to Yokai Studies," which gives an overview to the academic field he founded to debunk urban legends and rural superstitions. 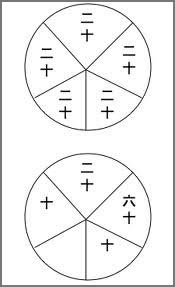 The second lets readers see Inoue putting his analytical techniques to work on an actual case: "On Kokkuri," his investigation of a Japanese fad derived from the then-popular American Spiritualist pastime of table turning séances. Inoue’s prolific efforts to tackle the hows and whys of the supernatural proved hugely influential in late 19th and early 20th century Japan, but only snippets have ever been translated into English. These two selections represent a quick overview of how Inoue categorized and analyzed mysterious phenomena. 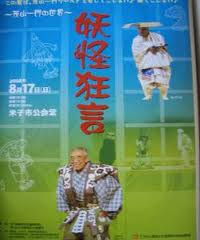 Taro Kaja 太郎冠者, the Kyogen Comic servant.
. Ghosts (yookai妖怪, bakemono　化け物) .
. Oni, Japanese Demons and Art 鬼　と美術t .